Well you may know from my sneeky peek that I chose a rather unusual colour palette for my canvas inspired by Linda Elbourne's project in Craft Stamper. I love turquioise, but wanted to add something with a bit of punch too, hence the red - I think it works although it is rather unorthodox! Unlike my blogging companions here, I have not gone for the understated approach, rather the more is more technique, or what I often call my "everything but the kitchen sink look"!! I have also gone a bit glittery and blingy, which is another diversion from Linda's original, I hope I will be forgiven Linda!! 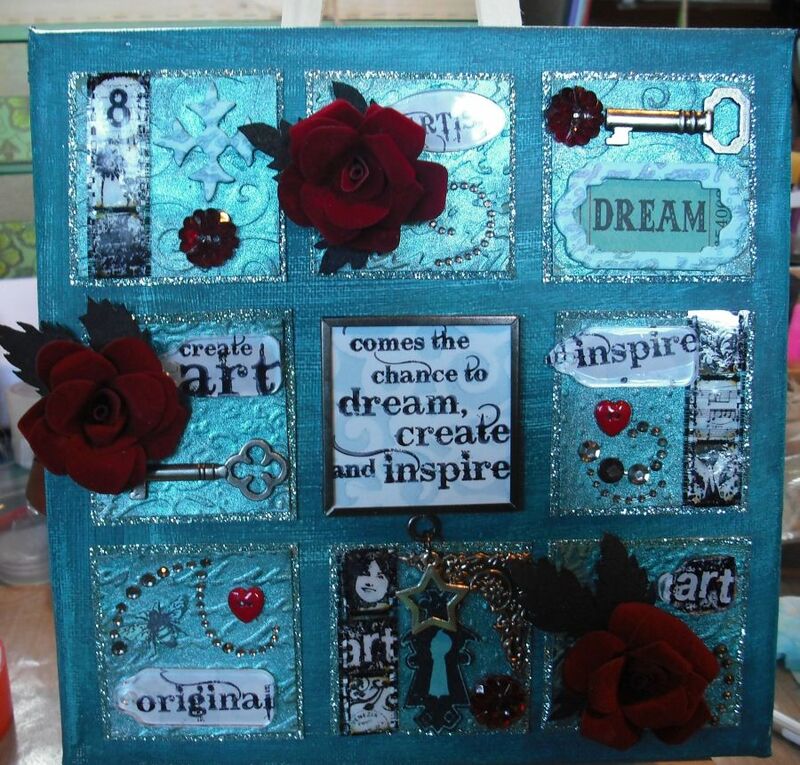 I painted my canvas wirh a Pool dabber, then I wanted a really true turquoise colour, so I actually made my background squares from a pale chipboard that I ran through the cuttlebug and then painted with precious metal paint. I backed each square with a matted layer of glitter card and let just a tiny edge show for a little sparkle. 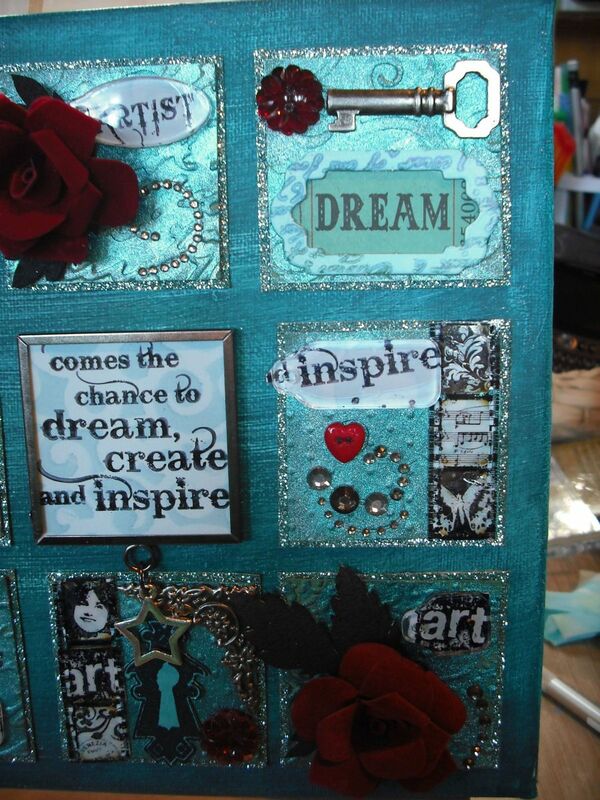 I used a lovely Darkroom Door set of stamps as my words and some images. I really struggled to find some words that fitted the memory frame, so this was a bit of one of the main stamps in the set. I needed a bit more space than a tag allowed so I used a semi gloss postcard to work on. I can't remember for sure which inks I used now, I know one was Tumbled Glass DI. I used a nice swirly mask as my background. 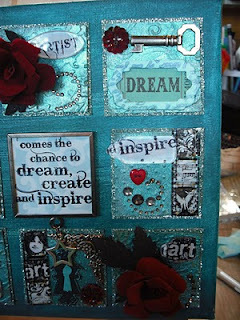 Although I did use Fragments for the first time, I also used some of the Tim Holtz film strip ribbon too for some of my images. Linda very kindly demoed how to stamp tiny images for using the ribbon when we were at Ally Pally a while back. 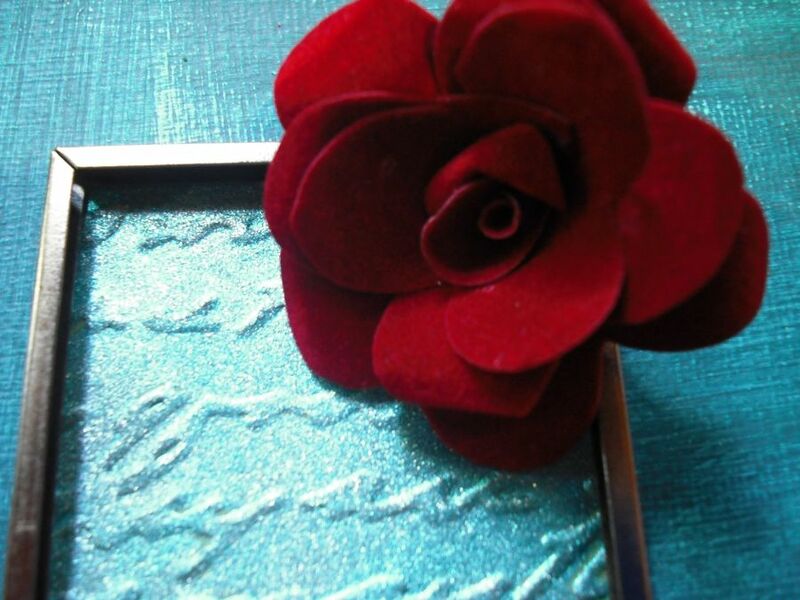 Linda also got me over my fear of making Grungepaper roses when I did a brilliant class with her when me and my CSQ pals went in holiday together in June, so I wanted to add some of them onto my canvas. 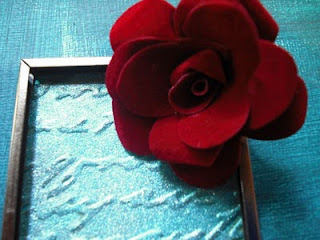 I made these out of red velvet paper and thought black leaves would set them off nicely. I used the lovely Jo Capper Sandon small bee stamp and a key hole that I think was a lovely freebie from Crafty Individuals. I added some lovely metal keys from K & Co, some red buttons and some jewelled flourishes. I just inked my chipboard frame and shape as I had already used metallic finishes, after all you can see I didn't want it to be OTT! So this is the full canvas and like Judith and Lesley I really loved doing this project, so thank you Linda for the inspiration in your article, on your blog and in your classes and demos. You make us laugh and we learn a lot too - what better combination could we ask for? Thanks for popping by and sharing our fun! Oh my word ... this is simply gorgeous and I find myself thinking that I could only forgive you for adding all those extra elements if you post your canvas to me without delay :0) LOVE LOVE LOVE it!!! This is amazing and the unusual colour scheme has worked well - nothing wrong with the bling and kitchen sink approach now and again. Love it!! What a lovely surprise to come back to Elaine! Your offering this month is fabulous and boy, do those colours work well together. You've definitely got the knack of the roses after Linda's tuition. I love all the elements you have used, most especially the film strips and the little keys. You have taken this project and quite definitely made it your own. It's really lovely my friend. The colours are amazing. The whole piece is so beautiful. Love the colour scheme, Elaine and all the bling. You can't go wrong with a bit of bling!! Quite stunning - just love the colour combination and all the elements. What a delicious creation! Your roses are just superb and very luxurious. The rest of your elements go so well alongside. 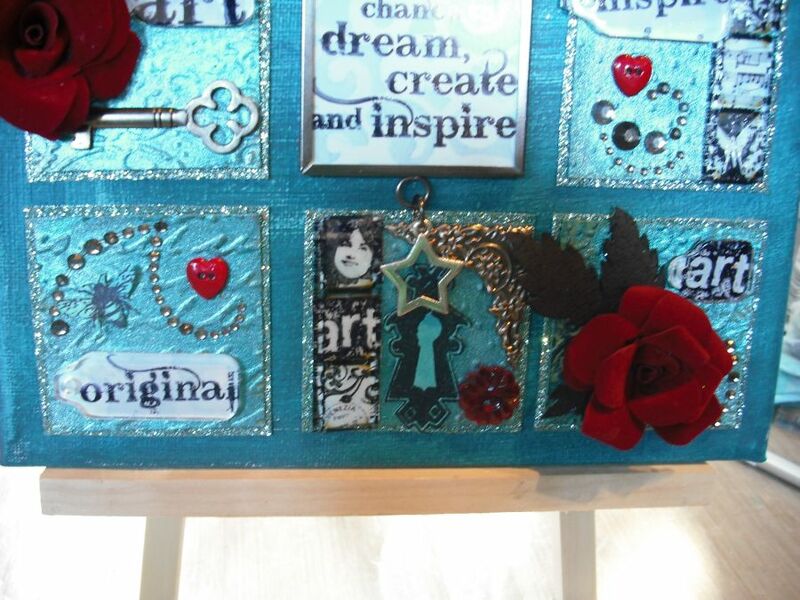 I think you have the perfect balance of inspiration from Linda's original project and your own style and preferences. Even so, this is blingier than your usual so quite a departure from your previous creations. I hope I can take inspiration from your bold colour choices and come up with something really eye catching. Wow gorgeous work! I love the colours - turquoise and red is one of my favourite combos :).